The Kings of Summer thinks its many things. It thinks its a light summer comedy about adolescence, a treatise on masculinity, a riff on any number of schoolboys having adventures stories, and a poignant study of a father and son. At some point it is each of these (perhaps the first most of all, though fitfully so), but for much of its runtime, it comes across as a movie that has a bit too much in common with its central characters: it doesn't know who it is, where its going, or what, exactly, it wants to say. This is a story about boys pretending to be men that feels like a highlight reel pretending to be a movie. Nick Robinson stars as Joe Toy, a teenager whose angst is telegraphed so broadly and so severely, it quickly becomes hard to empathize with him. His father, Frank (Nick Offerman, who comes ready to play and is given far too little to do) is hard on him since his mother died, and he decides to rebel by stealing his father's money, canned goods, and pasta, and heading off to live in the woods with his best friend Patrick (an expressive Gabriel Basso) and an oddball tag-along named Biaggio (Moises Arias). The boys form the sort of pact that young boys would and proceed to live out their own fantasies of what it means to be a man. This is all done for the sake of comedy, though the laughs come slowly and sporadically, and with a strong sense of portent that hints at the better film this could have been. The movie is populated with a cast of comedic ringers that seem sprinkled through scenes as if to give them some presence--the trick works, and everyone from Kumail Nanjiani and Hannibal Buress to Tony Hale and Mary Lynn Rajkskub elicits at least one laugh from their slight screen time. Offerman is solid, and there's always a hint of greatness I kept waiting to emerge--the character, like most here, is written write up to the edge of profundity, but the script is too tentative to ever reach it. Also very good are Megan Mullally and Marc Evan Jackson as Patrick's meddling parents, who have a patter that toes the line between cute-clever and over-written very well, mostly due to the strength of the performances. Alison Brie pops up occasionally as Joe's older sister, but again, its her presence more than the writing that makes the character pop. All three of the central boys also cry for better writing, with Basso in particular finding a near-perfect balance between angst-y teenager and goodhearted kid. Moises Arias should also be highlighted, as Biaggio is by turns the best and worst thing in The Kings of Summer, the former due to his affecting glances and ace comedic timing. Biaggio is less a character than a one-liner machine, and plenty of moments that could easily hint at depth are tossed off and completely forgotten, or worse, turned into completely off-base jokes that trade in punch lines for "[insert offensive words here]." Arias makes many of these moments work, but he can't do enough to save a character who feels added because this comedy lacked enough jokes. First time screenwriter Chris Galletta was in desperate need of a few more drafts, or perhaps a script doctor to tighten up the jokes and add some heart. As it stands, Galletta seems afraid to confront the darker edges of his story, such that many of the film's emotional peaks play more like the build-up to a climax than the real thing. On the other side, the comedy often feels forced, like the film got tonally confused at some point in pre-production and decided to be a comedy. This isn't to say the jokes don't land; plenty of them do, and I laughed fairly regularly throughout the film. But for every laugh line, there are four or five that just sit there, or are carried off by the sheer will of the performances. Similarly, director Jordan Vogt-Roberts (also a first-timer) seems to know how to use a camera, but not how to make a film. There are enough gratuitous shots of nature in this movie to fill a full programming block on the Discovery Channel, but if Vogt-Roberts thinks they're all supposed to mean something, he seems to have forgotten to let the audience in on what, exactly. There's a lot of slow-motion, lens flaring, and other "tricks of the trade" sprinkled throughout the movie, but they seem more like the flourishes of an unsure director than anything intended to add meaning or resonance to what is happening on screen. This is either the epitome of the "calling card" movie (made mostly to draw attention to the director's capabilities so they can land a bigger job) or just plain failure to understand what cinematography can add to a story, and what it can subtract when utilized poorly. 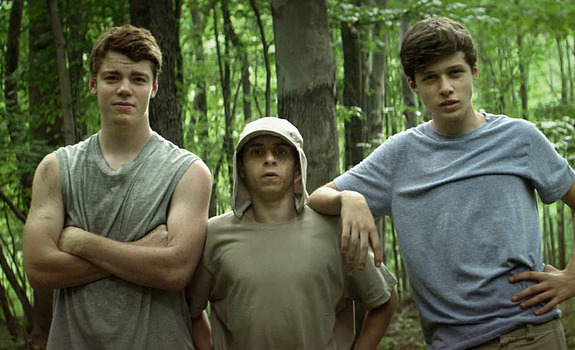 The Kings of Summer is a film by a first time screenwriter and a first time director, and it feels like both. This is not to say that Galletta and Vogt-Roberts don't have bright futures ahead of them; they very well might. But this is a stumble out of the gate for both, a movie that desperately needed a more seasoned hand higher on its crew to right the ship. The script verges on depth, and it feels as if it has things to say about adolescence, masculinity, and family, but it never figures out how to say them, except to have the characters come out and say things like "This is what men do" or "I think I broke my son." And this is the most over-directed film I've seen in quite some time, a display of style that belies any understanding of substance whatsoever. The Kings of Summer is a film for the season, I guess, in that its bright and airy and occasionally amusing. It also fits comfortably within the blockbuster season as the sort of forgettable indie that disappears as soon as the sun hits your eyes walking out of the theater.